Students use a compass to draw a circle design based on sixfold symmety and use their design as the basis for a poster celebrating Earth Day. Practice drawing intersecting circles with a compass. Plan ideas in your sketchbook. Think of a way to transform your circle design into something that connects with Earth Day. Figure out what type of lettering you want to use. Decide what information you need to include. Make a rough plan drawing in your sketchbook. Draw your design on good paper. 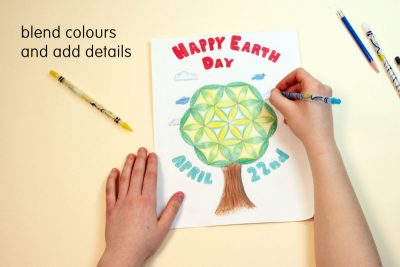 Choose colours that communicate a message about Earth Day. Blend colours and add details. View your poster with fresh eyes. - Is it carefully planned and completed? - Is the symbol based on a circle with sixfold symmetry? - Is the message simple and clear? - Does it use negative space to make it easy to see important information? - Does it have a dominant element that connects with the message? - Does it use colours that connect with the message? - Is the paper in good condition? organize a viewing of their videos. Prior to this lesson you may want to have students learn modern calligraphy using the Modern Calligraphy lesson plan available on this website. Teach or review the history and purpose of Earth Day. Provide time for students to practice using a compass. Download and display the Contrast, Balance and Colour posters available on this website. Gather, and make available, books about lettering, for example, Little Book of Lettering, by Emily Gregory; Adventures in Lettering: 40 exercises to improve your lettering skills, by Dawn Nicole Warnaar; Creative Lettering: Techniques & Tips from Top Artists, by Jenny Doh; Doodle Art and Lettering with Joanne Sharpe: Inspiration and Techniques for Personal Expression, by Joanne Sharpe; and Hand-Lettering (An Interactive Guide to the Art of Drawing Letters), by Megan Wells. Gather, and make available, books about Earth Day, for example, Here We Are: Notes for Living on Planet Earth, by Oliver Jeffers; Thank You, Earth: A Love Letter to Our Planet, by April Pulley Sayre; and You Can Save the Earth, Revised Edition: A Handbook for Environmental Awareness, Conservation and Sustainability, by Sean K. Smith. 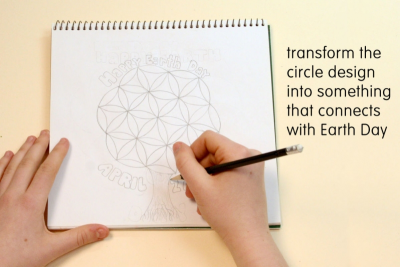 Demonstrate how to draw a circle design with sixfold symmetry. Read a quote about Earth Day and ask students to respond to it. View and discuss several posters, for example, Carmen and Peace, pointing out what makes them effective. View and discuss a variety of lettering styles, including modern calligraphy alphabets. 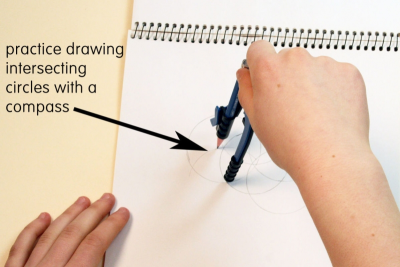 Use a compass to draw a circle design with sixfold symmetry. 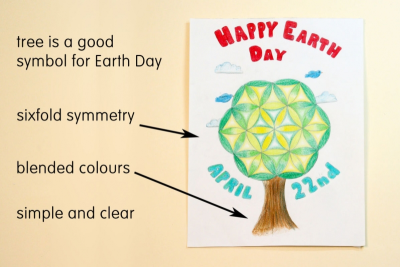 Use your circle design as the basis for a poster to celebrate Earth Day. Use borders and negative space to construct an eye-catching design. Select and arrange fonts to create a clear message. Observe students as they discuss the posters – active listening, insightful contributions, supporting ideas with evidence found in the artwork and from personal experience.